We’ve all been there before: it only takes one glance outside the window—to see snow falling yet again or notice temperatures approaching zero degrees on the thermometer—to be tempted into staying inside and training on a treadmill or indoor bike instead. Even if you love the snow, you have to admit the long winters in Chicago can be brutal, from the bone-chilling winds, to the near daily snowstorms. But what if you haven’t thought about the positives of training outside during the winter? What if there were more ways for you to become involved in (and interested in) outdoor training sessions than you realized? 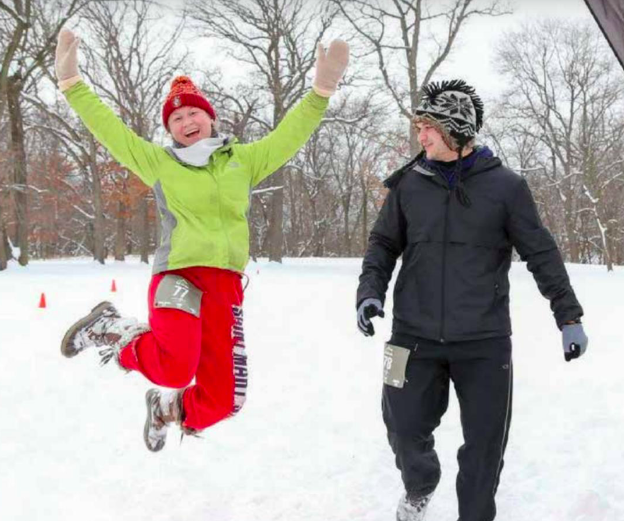 To help motivate you this winter, Chicago Athlete Magazine spoke to six local trainers, running coaches and marathoners who advise you to consider the following methods as you prepare to train outside. 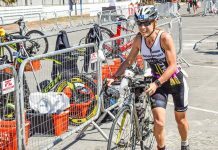 There are a variety of training groups, whether free (like those offered by lululemon and Fleet Feet) or paid (such as those provided by the Chicago Area Runners Association [CARA] and Chicago Endurance Sports [CES]), available in Chicagoland. Groups are especially important during the winter, as they offer much needed support and accountability. 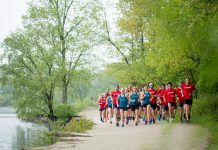 “A runner is more likely to go out for an outdoor run if he or she knows someone else is counting on them to show up,” says Brendan Cournane, owner and head coach at Coach Brendan Running. “By having others to train with, you will go farther and faster than you may have on your own,” adds Lauren Kersjes, a 2:44 marathoner and Olympic trial qualifier. Do members of the group have similar social goals as you? How long have the groups been meeting for—and what has led to their long-term success? Do the groups find ways to keep training fun, fresh and exciting? As runners seek new group training sessions, they should consider CARA’s half marathon and full marathon programs. The first group run for half marathon winter training was held on Nov. 7, while the first group run for full marathon winter training will occur on Dec. 29. According to Tim Bradley, director of training for CARA, pace groups can range from eight to 12 minutes, as run/walk groups are also available. Similarly, CES offers a winter training program, called Winter Warriors. Throughout a 12-week period, runners can train for upcoming 10ks or half marathons. Meanwhile, Universal Sole Running Events offers Fun Runs year-round in Chicago and the suburbs. The Fun Runs, which are always free, range from Burgers and Beer Runs to Tap Room Runs held at local restaurants and breweries. If athletes prefer to train with just one person, rather than a group of people, they should seek a training partner instead. Just like a group, this partner will provide support and accountability as well. To find a new partner, runners should consider reaching out to people they’ve met during previous runs, athletes they’ve spoken to during past running seasons or friends and acquaintances they’ve met at their gyms, as they may be interested in an alternative to monotonous indoor training. As athletes seek new partners, they should also think about training alongside people that either have the same ability level as them or are slightly better, so that they can maintain the same pace and even be motivated to improve their speed and endurance. Of equal importance, runners should also find partners that are training for the same distance as they are. The social aspect of partnering with friends or acquaintances should not be overlooked either. Like training groups, a partner may offer social activities in which the two runners can meet and discuss their fitness ambitions, according to McGee Koch. Sometimes athlete simply need to train in areas they’re the most accustomed to, as familiarity not only increases their confidence, but also provides them the motivation they need to run during the winter. Cournane advises runners to run at about the same time of day they’d run during the summer (unless it is later in the evening, of course). As they implement their usual summertime routines, they can start with shorter runs—typically 15 to 30 minutes—and then extend them whenever they’re ready. 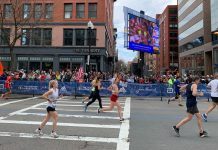 At the same time, Cournane also believes runners will grow the most, particularly as athletes, if they’re able to leave their comfort zones, especially during the winter. Very few aspects of life inspire people more than a new outfit — if they believe they look good, they’ll feel good, have more confidence and, in turn, perform to the best of their abilities. For winter training, proper running gear is a necessity, and the purchase of new gear may motivate athletes to leave their treadmills behind for the winter. In addition to tops, runners must ensure they have the following items as they prepare to train outside this winter, according to Feinberg. Gloves and Hats. Feinberg believes mittens will provide runners more warmth, as they keep fingers closer together; if more heat isn’t necessary, then gloves are also a good option. Additionally, athletes’ heads must remain warm (or else the rest of their bodies will cool down quickly), whether they prefer wicking winter hats, headbands or even hats with an opening for ponytails. Pants and Tights. Above all else, athletes must ensure their legs remain warm and loose throughout their runs; their pants or tights will have a considerable influence on this key aspect of comfort and performance. Reflective Materials and Vests. Oftentimes, runners have no choice but to run early in the morning or at night. To protect themselves, they must remember to wear reflective materials or vests. Although most shoes will perform just fine in most weather conditions, the more traction, the better—whether runners add clip-on cleats to the bottom of their shoes, purchase water resistant options, buy trail shoes or have shoes that feature lugs on their bottoms. Aside from clothing, some athletes may also need to wear sunglasses that protect their eyes from ultraviolet rays in the wintertime. Wider sunglasses (than the ones runners usually wear in the summer) may also be helpful to shield their eyes from the snow and wind.